Carmella telling Harold about Will's Dad being an accountant. Carmella telling Will she's been offered a place back at the convent. Paul and Lyn at the altar with Paul not saying his 'I do'. In the church where Sindi and Stu tied the knot last year there's still a pregnant pause thing happening while the reverend once again asks Paul if he'll take Lyn as his lawfully wedded wife. Paul finally snaps out of his spaced out state and says ‘yes'. PAUL: Yes, I do. I do take this beautiful woman… (he takes Lyn's left hand and put the ring on her finger) …Lyn Scully, to be my wife. They kiss and hug and there's sighs of relief all over. Except maybe for the Pizzy™ shippers who still can't believe it's not Izzy that Paul's marrying. Hey, maybe that's the reason why Lyn with her big family and Paul with his big social network has only managed to get 25 people in total together for the ceremony- all their friends and family are Pizzy™ shippers! That would explain a whole lot actually! Carmella's looking herself in the mirror when Harold arrives home for a quick cuppa and a lie down before going to the Plyn™ wedding reception. Will's on his way to pick Carmella up to go there too so she suggests they all go together, but Harry turns down the offer. Harold would like to thank Will for having his new accountant paid for though, it's apparently a really high status one. HAROLD: It's who does your books. Harry's not sure this firm really deserves their great reputation though since they didn't even know who Will's Dad was. Carmella says that Will seemed to have trouble remembering that his Dad was an accountant the week before and Harold suggests that maybe it's just Will's cover story. HAROLD: Maybe Griggs Sr. is a spy! They have a laugh about it and Carmella goes to open the door since there's someone there. It's Will and he has nothing to say about the way his girlfriend looks but ‘wow'. She gives his looks a ‘wow' too and Harry leaves them alone so that they can have a chat in private. Will wants to know if everything's okay and Carmella says he's the one who should be telling her. The Robinhoyscullys (i.e. Steph, CharlieInClothes™, Lyn, Paul and Elle) are on the steps outside the church to have their photos taken by Karl who's now turned into a professional photographer overnight. Ah, the amount of time necessary to get a qualification in Erinsborough continues to be amazing! It's also funny how Karl wasn't even at the ceremony in yesterday's episode and now it's like he's been there all along! In a similar fashion, but the other way around neither Janelle, Janae nor Boyd are to be seen today. Hmm. Lyn's hair has somehow changed between her arriving at church, getting inside the church, getting through the ceremony and then walking back out again without her touching it. Ah, MagicHair™, how fun! Her fringe was to the sides all the way through before, but now it's combed to the front. Hmm. Paul's having a ball with the pictures being taken and plays around with posing in different ways and talks about them having a photo taken with both of the evil step-sisters. Lyn realises that Ozzie's missing and then Toadie appears from inside the church, despite not being there in yesterday's episode, with Ozzie on his arm. They all pose again with Ozzie at Steph's feet and Paul suggests they all say ‘step-family' instead of cheese as the pics are taken. Susan, who has snuck up next to Karl, keep refrain from making some snide remarks at him asking if photography is his next ‘big thing' and in the same tone Karl replies that his photos are better than any professional shots. KARL: They'll have heart, warmth and a little touch of cynicism. As we see Lyn and Paul exchange cute looks in a way we haven't seen since they were *blatantly* flirting in the Scarlet Bar in 4981 through Karl's camera lens, Karl and Susan talk about them. SUSAN: Who would have thought it would have ended in church? KARL: I would have thought it would just end! I mean, what was with the pause? Hehe. Is this Karl still holding a grudge over Paul's ‘rabbit' comment over dinner in 5062, I wonder. After taking a picture of Paul making a bit of a crazy face as per his request, Karl gets back onto the topic of the pregnant pause. KARL: You reckon he was having second thoughts? SUSAN: I don't know. Maybe he was just overwhelmed by emotion. He seems to really love her. KARL: Yeah, says he does. SUSAN: …it's a pretty powerful force, you know. KARL: Yeah, the right time, the right person… (looks at Susan) Nothing stronger. Karl lets his camera keep taking pics of the Robinhoyscullys as he kisses Susan until he sees Elle starting to throw rice in the air. KARL: No, no, no, no! No, rice is worse than confetti! SUSAN: Don't worry about the birds! Elle then starts throwing her rice at Karl instead much to Susan's amusement. Lyn suggests they go to The Park™ to take some real photos and as the rest of the bridal party head off, Paul gets Lyn to stay behind with him for a bit. PAUL: You are too good for me, Lyn Scully. LYN: You know, I thought you might have forgotten that. What happened in there? PAUL: I was just asking myself, ‘Do I really and truly deserve someone like you?'. LYN: Good answer. And it's Lyn Robinson, by the way. They smile and kiss with the beautifully lit up interior of the church in the background. Aww. Carmella has put Will on the spot regarding his Dad's actual work place. When he hesitates she wants to know if he's trying to come up with a lie and gets upset because they're a couple and should be able to share important stuff with each other. This kind of thing which is so basic shouldn't even be a problem and Carmella wonders why Will's being so secretive. Will says his Dad used to work at the accountant firm Harold's now at but now he's in private practice. Will's Dad couldn't take the case on so Will arranged for another accountant to do the job instead. Carmella says it's too expensive, but Will says it's done now so it's too late to go back. Carmella suggests Will tell Harold the true story but then Will gets upset and gets ready to leave. WILL: It's like you're trying to find a reason to split up with me. He reckons that this could be Carmella's way of getting him out of the picture, by being too inquisitive so that he'll leave by own accord and she can go back to the convent without feeling bad about it. Carmella wants to know there this is all coming from and Will tells her they should go to the reception separately since she obviously doesn't trust him. In this gorgeous big hall with a very lofty ceiling there's white, white, white everywhere to be seen except for the curtains which are beige. 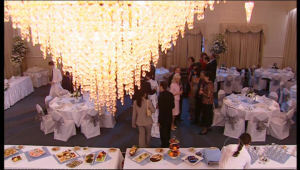 There are white chair covers, tablecloths, flowers, waiters' shirts, the coat-like thingy that Lyn's wearing over her bright blue dress… The 25 extras from the church have made it there in one piece for the wedding reception and some Ramsay St people that were there yesterday have been replaced with some other ones that weren't even at the church. There's Ned and Will for example and then Harold and Carmella who are arriving a little late. Paul asks for everyone's attention so that he can make a speech. PAUL: I'd just like to say, thank you all for coming and spending this very, very special day with us. I know some of you thought we would never get here. And for those of you who still doubt the way I feel about Lyn I'd just like to say- she means the world to me. You see, when it comes to love you don't have to think about the way you feel. It's just a clean cut ‘yes' or ‘no'. (holding Lyn's hands in his) See, ‘maybe', that's a ‘no'. ‘Could be', that's a ‘no' as well. Right about here Lyn's heart turns into a pile of mush and I bet all the Plyn™ shippers are all going ‘Awwwww' here too. PAUL: But a yes, oh God, that's so rare. (with tears in his eyes) And you must never, ever turn your back on it. Especially when she lives in the same street as you. Lyn laughs and I laugh too because this kind of stuff is exactly what make me love this pairing in the first place. They kiss and Paul asks everyone to raise their glasses. PAUL: I'd like to propose a toast to my adorable new wife Mrs. Lynette Robinson! Lyn goes a little weak at the knees at the thought of being Mrs. Robinson as everyone raises their glasses to her while saying ‘Lynette Robinson'. I guess she was hoping someone would belt out in a ‘And here's to you, Mrs. Robinson, Jesus loves you more than you will know, wo, wo, wo.' Instead of dancing to Simon and Garfunkel Paul asks Lyn to have the first dance to dance to a waltz and they start swirling around the floor. Steph and Toadie, Elle and Ned and Harold and Carmella also take to the floor. Carmella comments on how beautiful Paul and Lyn look together and I can only agree. She continues by telling Harold that she thinks Will might have been pushed too far now by what she said before, but Harold says it's probably not as bad as she thinks it is. Will approaches and says he didn't come up to her earlier because he was feeling guilty. Carmella apologises for harassing him for answers before and he says there's only one answer he's interested in- would she like to dance? She accepts and they start dancing, much better than the couple that's been right behind them throughout their conversation- those two have just been sort of wiggling a bit without actually getting anywhere! Then Paul and Lyn come twirling past and those two have really got their act together because they move very swiftly across the floor! We cut to a bit later and Lyn thanking Susan for everything saying how she couldn't have done it without her. Aww. Lyn walks up to Steph and Ozzie (who is playing with pieces of fruit) asking if they'll miss her while she's gone. Steph says her little brother will be fine and he'll have fun with Charlie. STEPH: You just enjoy the Maldives, right. Make sure you actually get to the beach! Hehe. I guess this comment goes along well with Lyn saying she was going to have a very saucy honeymoon yesterday though so why she's all shocked now at what Steph's saying I don't know. Elle tells Paul she thinks things are really going to work out for him and she says she'll be fine without him too- she's got his credit cards! Paul and Lyn get ready to leave and Lyn thanks everyone and gives them a ‘mwah' before they go. All the guests applaud the newlyweds as they leave the room. We see Steph and Ozzie send lots and lots of air kisses to Lyn and Paul who are already in their car. Lyn tells someone (Susan, Elle, Steph, anyone?) not to wait up and they wave bye-bye to all the guests. Paul kisses her again and then we see everyone wave them off as the car with a ‘Just married' sign at the back and some rattling cans hanging behind the car too. Karl looks really grumpy as the car drives off and Susan picks up on it. Out of their wedding clothes faster than you can say ‘Plyn™ wedding', Elle is following Ned around telling him to arrange with a new Santa for this thing they're doing. The other Santa got held up by a snowstorm at the North Pole and it's Ned's job to find a new one. Elle spots some moving elf hats down behind the bar and Ned says they Santa's elves who are there because they like to help. She tells him again to find her a replacement Santa and a smiling Toadie who's at the next table over from Ned seems like the obvious option. TOADIE: No way, man. I've lost weight! I don't' even have a full beard! The words ‘ho, ho, ho' don't even make me think of Christmas! Ned looks uncomfortable. I think, it's hard to tell with his lack of facial expressions. Lyn's running into the room, trying to stop Paul from carrying her over the threshold as she doesn't want him to risk it with his bad leg, but he says he just wants her to have ‘the full experience'. They kiss again and have now nearly surpassed the total amount of kisses they've shared throughout the whole storyline just in the first 10 minutes of this episode. LYN: (giddy) We're actually married! PAUL: And you're happy about it? LYN: I've never been happier in my life! Oh yeah? So what about the time when you married Joe and had your five kids then? Hmm. Lyn goes to change into something a little more ‘comfortable' i.e. the raunchy negligee that Susan bought for her the other day and Paul calls Lyn a ‘naughty girl' before she heads off to get changed. Steph's got Ozzie on her arm and tells Toadie, Harold and Ned not to use the ‘M' word (Mum) to stop Ozzie from missing his Mum too much. Ned says he's got some bad news about Santa, he's not coming. Harold volunteers, but Toadie says he'll do it and Steph's really pleased. Harold's in the background trying to put forward himself as an option, but no one really cares. Ned drags Toadie to the back office to get changed as we cut to Susan and Karl who have been watching from afar. KnowsItAllKarl™: There's something going on between those two? KnowsItAllKarl™: No, Steph and Toadie. She can't take her eyes off him. PlayingDumbSusan™: Oh, you're imagining things. KnowsItAllKarl™: Susan, I can catch the vibe when it's out there. You're losing your touch. SantaToadie™ is busy ‘ho,ho,ho'ing when Harold comes up to him, clearly jealous of Toadie being Santa instead of him, saying how Toadie should give up his spot to someone else if he doesn't feel up to it. Ned pops his head out from Toadie's office and Toadie walks over to him to have a proper look. Ned's wearing an elf hat, a teeny tiny little vest, fairly tight shorts, tights and boots. When he comes out so the kids and parents who have come to see Santa can see him, one of the mothers asks to have her picture taken with ElfNed™ instead of with SantaToadie™. Paul's on the balcony looking out over a sunny Melbourne all lost in thoughts when Lyn walks up behind him in her silky black dressing gown, hugging him from behind. He turns around to face her. PAUL: I really do love you, Lyn. LYN: Well, that's good because you did just marry me. PAUL: Yeah. I also just flirted with the woman who brought me the champagne. PAUL: Lyn, that's who I am. I can't do this to you. I cannot be married and not hurt you. LYN: What are you saying? PAUL: See, that's why Izzy and I were such a good match. Because she could give as good as she got. LYN: No! No, you've changed! PAUL: I had an affair with someone else within the first six weeks. Who? If he means Carmella then that doesn't fit in with what we know since that was before Paul and Lyn were serious, they were just ‘friends with benefits at the time'. From what we know Paul was also faithful while he was over in New York. There have been so many beginnings for this pairing it's hard to know what week was even the first. Lyn's just shocked right now, she can't believe what she's hearing. PAUL: I kissed Rosie in the cellar. And if I had the chance I'd do it again and again and again and again whenever the opportunity presented itself. At this point Lyn's just shaking her head in pure horror and the look on her face is just heartbreaking. PAUL: You had your doubts about me that night and you were right. Come on, we're fooling ourselves. Paul put his hand on Lyn's cheek and she puts her hand over his, almost clinging to it. PAUL: …And I know I love you enough to admit that. Lyn has a glimmer of hope in her eyes for a millisecond before Paul turns around and leaves. In a similar fashion to when Karl left Susan behind after he told her about him being the father of Izzy's child in 4502, Lyn's just standing there shaking and trying to breathe, shell shocked. Oh man, this heartbreak is so powerful you can feel it like chills down your spine. Big kudos to Janet and Stefan for playing this so perfectly. Will and Carmella arrive home from the wedding reception blissfully unaware of the heartache the bride is going through at that very minute. They talk about how they enjoyed the reception and the dancing and Carmella apologises for being so inquisitive before. Will asks why Carmella went quiet earlier and realises that she's made a decision about her future. She tells him she's decided not to go back to the convent. Toadie's counting the money they raised for the charity the whole thing was for and Ned discovers a scratch mark on his stomach. One of the mums must have done it to him. Steph says the guys both did a great job, but Harold tells Toadie he wasn't that impressed with the ‘ho, ho, ho's. TOADIE: You couldn't have done it any better? Susan and Karl come in and Karl wants to know why there are women in the Scarlet Bar saying that there's a stripper in the offices. Then they see Ned and it all makes perfect sense. Karl even makes a comment about Ned's clothes being a bit on the small side which reminds me of Karl's leather pants from 4981. ‘You wouldn't want to cram in Woodstock into West Warratah Bowling Club, now would you?' ‘Although you did manage to cram your middle age spread into those pants.' Ah, good times. Ned says hell go and get changed, but he can't go into Toadie's office since Ozzie and Charlie are asleep in there. Toadie says he's free to go in and use ‘Bob's room' though and Karl's a bit upset over his office turning into a ‘kennel'. Susan asks Toadie if he's decided where to go for Christmas yet and he says he hasn't decided whether to go to Colac or not yet. Steph's mobile rings and she's surprised to find that it's Lyn calling. TelephoneChipmunkLyn™ is apparently speaking very quickly because Steph tells her to calm down. Lyn's just sitting on a bed staring blankly out the big window where there's a sea view when Steph and Susan arrive. They want to know what's happened and Lyn tells them ‘it's nothing, really'. STEPH: But you were so upset over the phone. LYN: Yeah, I'm sorry, love. I overreacted. SUSAN: Steph said that Paul had left you. LYN: (calm) Oh, there's me playing the victim. No, it's just a… We had a talk and we realised that we'd married each other for the wrong reasons. So lucky we found out sooner than later. LYN: (determined and with a smile on her face) So, I've got a honeymoon to go on. I'm going to take Oscar with me, where is he? SUSAN: (bewildered) He's um, he's down in the foyer with Karl. LYN: That's good, that's good. OK, so we're going to the Maldives and then we'll visit Flick and Shell on the way back and it'll be fun. STEPH: No, no, Mum, hang on… But you were so happy marrying Paul. LYN: Yes, love, but now I realise that the sensible thing is to get an annulment. STEPH: Mum, just… Can you just stop? Just stop protecting him, please. He's done a terrible thing to you. LYN: See, he did it for me. (teary-eyed) Because he can't be married to me without breaking my heart. (starts crying) He broke my heart. Lyn breaks down on Susan's shoulder and again you can really feel how much this is hurting for her through the screen. Excellent stuff by everyone in this scene, but Janet just takes the cake since she's just spot on with her performance. Paul's at the kitchen counter in the dark, looking at his wedding ring. Elle comes down the stairs with the sucking part from a vacuum cleaner in her hand, thinking there was a burglar in the house. ELLE: You're meant to be on your honeymoon. ELLE: How? Everything seemed so perfect this afternoon. PAUL: I really love Lyn, you know that. I mean, I really, really love her. ELLE: So where is she? PAUL: What do I do to the women in my life, darling? Hey? I crush them, don't I? I can't do that to Lyn. ELLE: So you left her? PAUL: Darling, it's got nothing to do with you. It's just me, I'm too damaged. ELLE: And you know it! You know that! But you've always got your finger on the self-destruct button! You know what, Dad, I'm going back to Tassie! ELLE: NO! If you want to destroy your life then go ahead, but I'm not going to stand here and watch you do it! Lyn's just staring blankly into the air with tears in her eyes when Elle pops her head in through the door. ELLE: Lyn, I'm so sorry. LYN: No, no, don't be. No. I don't want to upset you. ELLE: Trust you for putting my feelings first. I hate Dad for doing this to you. LYN: No, no, don't hate your father. You know, in his own way he did the right thing. ELLE: You would have made such a great step-mum. As Elle and Lyn hug, a tired-looking Steph and Susan appear from the adjoining room. Elle leaves and Susan asks if Lyn's really up for the trip. She says she is and reckons it's going to be good, she won't get lonely either since she's got Oscar with her. LYN: Without you girls… I don't know what I'd have done. Steph gives her Mum a hug and Lyn smiles. 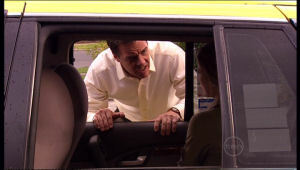 Elle puts her bags in the back of a taxi with Paul following her, trying to convince her to stay. Elle says she'll be back after Christmas to pick up the rest of her things. PAUL: Elle, I need you. ELLE: I'm sick of watching you being you, Dad. It's killing me. And then the taxi drives off, just as Karl, Susan and Steph arrive back. Steph gets out of the car, walks straight up to Paul and punches him in the face.